I used to eat Chinese take out all the time for lunch when I worked at the nursery. There was a local restaurant within walking distance that had a really good deal on lunch specials. It got to the point that they recognized our work number and we had the lunch specials memorized by number. And all that story aside, what really inspired this meal was the movie theme, which was Heaven and Hell (hence the sweet and spicy). We watched Constantine and Dogma. 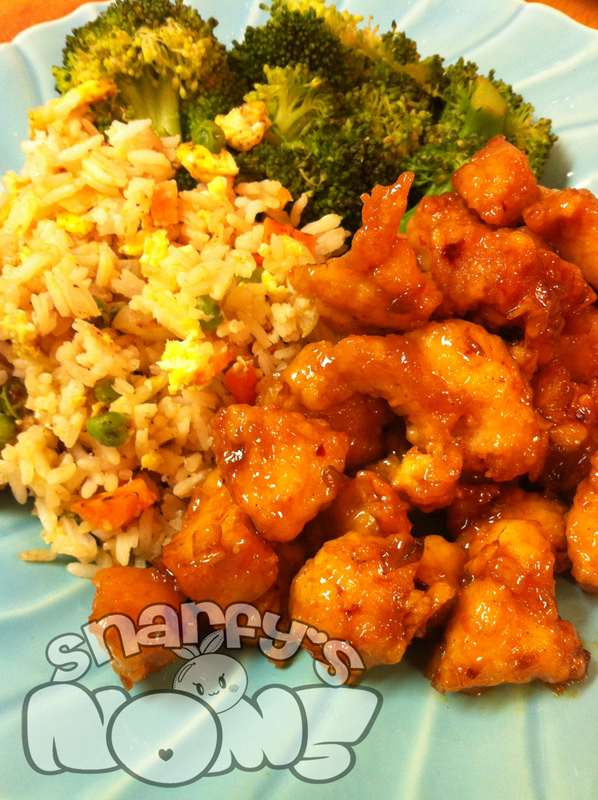 The orange chicken was served up with some fried rice, which is pretty easy to make. Throw some chopped veggies that you like in a pan, scramble an egg with it, toss in the rice and add the soy sauce of your choosing. It’s totally that easy. Broccoli on the side is just a good way to round it out. By the way, Arc’s broccoli intake since I’ve been hanging around the Rumpus Room has increased like 1001%. Poor guy. Cut your chicken breasts into bite sized pieces and put them in a large bowl. Add in the egg, salt, white pepper, and 1 tablespoon oil. Mix that all together. In a small bowl combine cornstarch and flour. Add cornstarch and flour to chicken mixture and toss to coat. Heat the oil for deep frying in a wok or your favorite deep frying pan or device. Once the oil is hot, add the chicken in small batches. Fry until golden crisp and cooked through. Remove from oil and drain on a paper towel lined plate. Set the hot oil aside in a safe container to cool down and reuse. Get the wok back on the fire and add a little bit of oil if needed. Add the ginger and garlic. Stir-fy until fragrant. Add the red pepper flake and green onions. Add the white wine vinegar, soy sauce, sugar or honey, white vinegar, orange juice and zest to the pan. Make sure everything is heated through. Add the chicken to the pan and in a bowl combine the water with the reserved tablespoon of cornstarch. Add the corn starch slurry to the mix and keep on the heat until the sauce is thickened. Dress with sesame oil. For an alternative, use yellow onions chopped into larger pieces with some green bell pepper and pineapple chunks. Yeah, you just make Orange Sweet and Sour Chicken, you fancy person you.